In a larger pan, sauté the onion, green pepper and garlic in the olive oil. Sauté until onions are translucent, add beef mixture. Add olives and raisins and simmer another 5 minutes. Pass the flour with salt, baking powder and sugar through a strainer. In a mixing bowl place half of the flour, butter, shortening, eggs and water and mix well. Gradually add more flour until all of the flour is added. The dough most be soft and pliable, like pie dough. Place the dough in a bowl and let stand for 30 minutes at room temperature covered with a damp cloth. Roll your dough to about 1/8 to 1/4 inch thick and cut out 5 to 6 inch circles from your dough. Place a couple of tablespoons of the filling in the center of you cut out dough and with your finger wet the rim of the circle and fold the dough over. 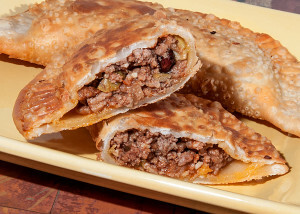 Press down on the edges of the joined edges with a fork to close your empanada. With a tooth pick prick a little hole on each side to allow steam to escape while frying. In a frying pan at medium heat and once hot fry the empanada flipping it over once until golden brown on both sides. remove from the pan and place on a cookie sheet or paper towel to drain excess oil. Serve hot.